You know those days when you’re starving, too tired to cook, but don’t want to indulge in typically rich restaurant food? Commune Cafe is the easy way out. Not only does my favorite neighborhood spot serve healthy options (egg whites, 9-grain flax bread, water-based oatmeal), each and every one of their ingredients is local. If you’ve seen the documentary Food, Inc., this fact alone would convert you into a regular. 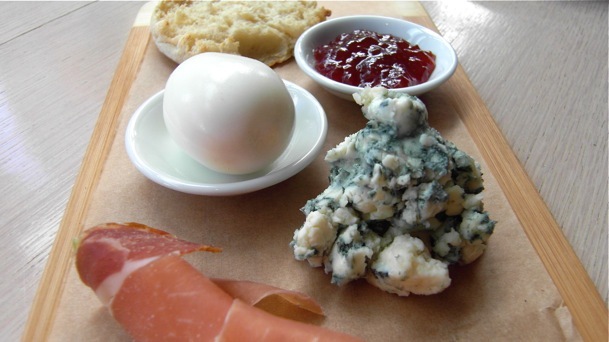 The downtown restaurant cafe, touting Green Table and Ocean Wise ingredients, has recently expanded their breakfast and brunch menus, and added new salads, sandwiches, and entrees to its all day and dinner menus. My mom joined me to help sample, then polish off five of the new breakfast/brunch options. The ‘European’ breakfast (above) satisfied my appetite and every part of my palate with its sweet, salty, fruity, and creamy components. 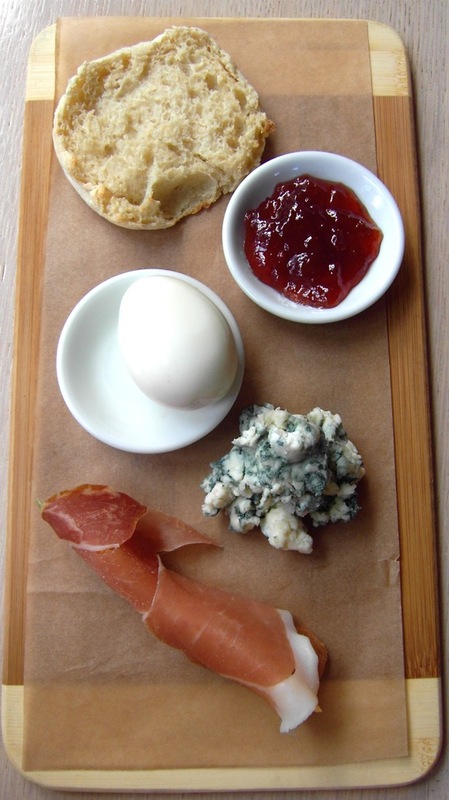 On the board: half a whole wheat English muffin with strawberry jam, a chilled hard-boiled free-range egg, salty prosciutto-wrapped melon, and a generous portion of Quebec blue cheese (great with every bite). 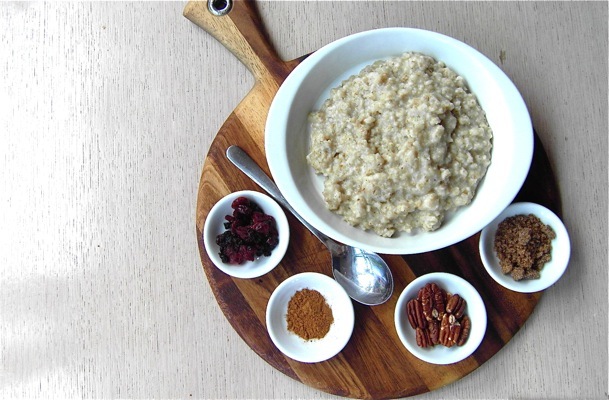 The ‘do-it-yourself’ oatmeal leaves you in control. Add sundried cranberries, black currents, cinnamon, brown sugar, and toasted pecans as you like. And for those of you who count calories or who are lactose intolerant, the oatmeal is made with water, as opposed to milk. I was planning on leaving the whole sausage for my mom (normally not my thing), but when I learned Commune’s is sourced locally and made with turkey, I dove in. 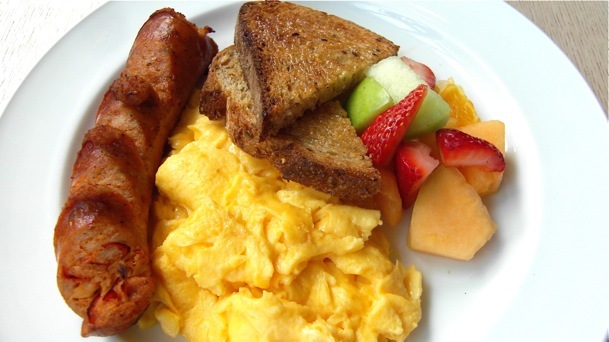 With each bite of free-run scrambled egg (there’s an egg white option, too), I paired a bite of maple-chili flavored sausage. It was spicy, juicy and delicious. 9-grain flax toast was a nice healthy option on the side. 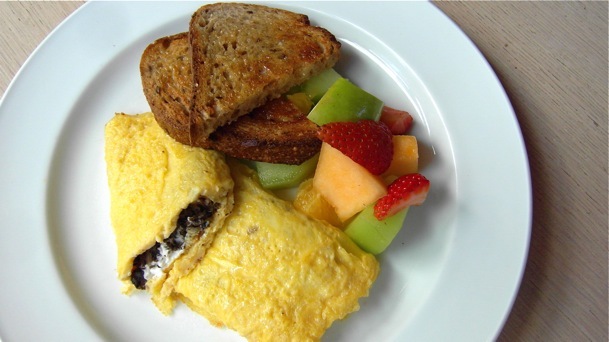 Again, there’s an egg-white option for the omelets, which come in three flavors: Bacon and Cheddar, Tomato and Mozzarella, or the pictured Mushroom and Goat Cheese. Commune roasts their mushrooms in house, before grinding them into a sort of mash. 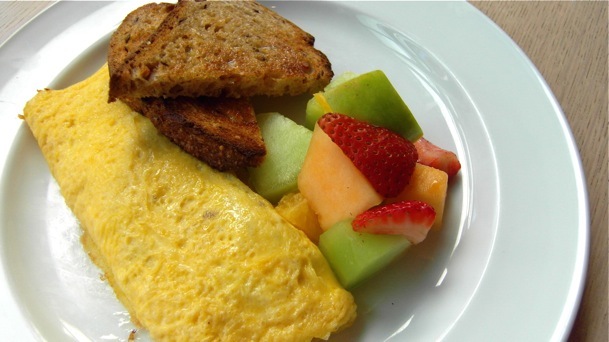 Teamed up with the melting cheese, the substantial omelet was soft and flavorful — one of my favorites. 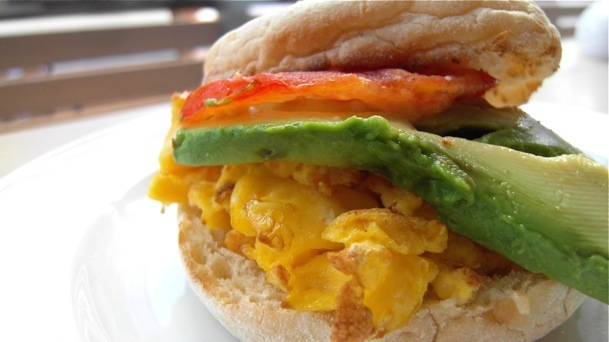 The avocado, tomato, free-range egg and cheese sandwich is perfect if you’re on the run. And isn’t this just the type of thing you’d make at home if you had the time? 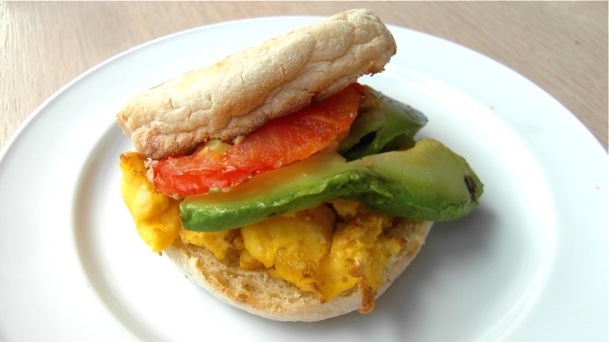 There are no hidden ingredients here — no butter coated bread or eggs, just fresh, simple, healthy ingredients. Perhaps this is why so many of the Canucks are regulars are Commune. At least once a day, they’re in ordering take-out. And just this past weekend, I saw Jodie Foster there twice. Considering Commune’s local food suppliers, it’s amazing they keep their prices so low. If you hadn’t noticed, scroll up. I’ve included prices in the caption of each picture. Eye-opening documentaries, like Food, Inc., helped me realize why we owe it to our environment to pay more for our food. Often, organic food costs more to produce because it’s coming from small farmers, as opposed to massive corporations who have penny-pinching down to a fine art. You’ve got to wonder how McDonald’s charges a couple of loonies for a burger. Watch Food, Inc. (with your children or as many friends as possible), and I guarantee you’ll be moved to eat at restaurants like Commune, and shop at Farmers’ Markets or grocery stores like Choices or Whole Foods. If you get to Commune, let me know how you enjoy it. Food aside, their space is impressive. Their interior is up for an international ‘best design’ award. It’s also a friendly, warm environment, and a great place to pull out your computer for an hour or two of work. Did I mention they sell my banana bread? View Commune’s full breakfast and brunch menus here.